The Tableau Server repository is a PostgreSQL database that stores data about all user interactions, extract refreshes, and more. You can enable access to the repository and use the data in it to help analyze and understand Tableau Server performance. Looking for Tableau Server on Linux? See Collect Data with the Tableau Server Repository. After you enable access to the Tableau Server repository, you can create views with data from the repository. The views that you create with this data are sometimes called custom administrative views. In addition to being used for performance monitoring, custom admin views can be used for tracking user activity, workbook activity, and more. For more information on the type of data that you can use for these views, see Create Custom Administrative Views and Workgroups Database. Alternatively, if you are only interested in performance data, you can use the preselected database tables in the sample performance workbook. You can use Tableau Desktop to connect to and query the Tableau Server repository using two built-in users. The user named tableau has access to several database views you can use as part of building your own analyses of Tableau Server activity. The user named readonly has access to additional database tables that you can use to create views for even more in-depth analysis and this is the user we recommend you use. Before you can connect to the repository, you need to enable access for the readonly user to the database. Use the tsm data-access repository-access enable command to enable repository access. When you enable repository access, you also create a password for the readonly user. You will use this password to access to the repository. You may also need to have port 8060 opened so you can connect to the database. If your password includes special characters, then you must enclose the password in double quotes. This command will restart Tableau Server. Note: If you later decide that you want to disable remote access to the Tableau Server repository, use the tsm data-access repository-access disable command. The command disables external access to the repository. This will not disable access from localhost. For more information, see tsm data-access repository-access disable. This section describes how to connect to a custom set of tables from Tableau Server repository.For more information on the tables that you can connect to, see Workgroups Database. In Tableau Desktop select Data > Connect to Data, and then select PostgreSQL as the database to connect to. Note: You might need to install the PostgreSQL database drivers. You can download drivers from www.tableau.com/support/drivers. 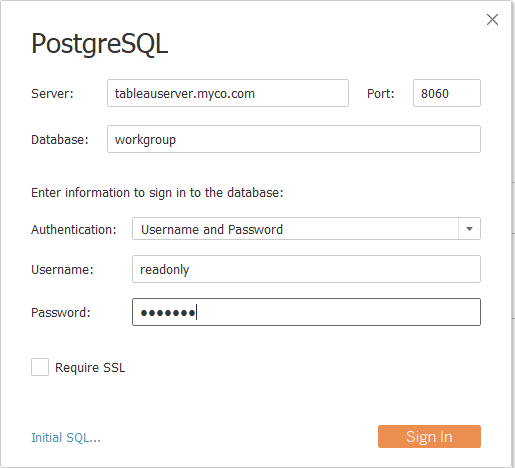 In the PostgreSQL connection dialog box, enter the name or URL for Tableau Server in the Server box. If you have a distributed server installation, enter the name or IP address of the node where the repository is hosted. Connect using the port you have set up for the pgsql.port, which is 8060 by default. Specify workgroup as the database to connect to. Connect using the user and the password you specified. Click the Require SSL option if you have configured Tableau Server to use SSL for connecting to the repository. For more information, see Configure Postgres SSL to Allow Direct Connections from Clients. Select one or more tables to connect to. The tableau user has access to all of the tables that start with an underscore or with hist_. For example, you can connect to _background_tasks and _datasources. The hist_ tables include information about server users that isn't currently presented in the Actions by Specific User view. The readonly user has access to additional tables that can be used to query other information about server usage.